88 mins. Rated R for strong language, sexual content, drug use and some crude humor. In this yearly celebration of stoner-movies, we look at a rather popular comedy from about ten years ago. In Harold & Kumar Go to White Castle, we meet Harold (John Cho, American Beauty, Star Trek Beyond), a Korean-American man working in investment banking, and his friend Kumar (Kal Penn, TV’s Designated Survivor, Epic Movie), an Indian-American who feels as if he is being forced into his family’s line of work as doctors. The two love hanging out, watching movies, and getting stoned. Tonight, though, they have a hankering for a very specific munchie. Tonight, they must have White Castle. The two stoners take to their quest with much vigor and, along the way, get into crazy shenanigans involving an escaped cheetah, racist cops, and Neil Patrick Harris (played by Neil Patrick Harris). 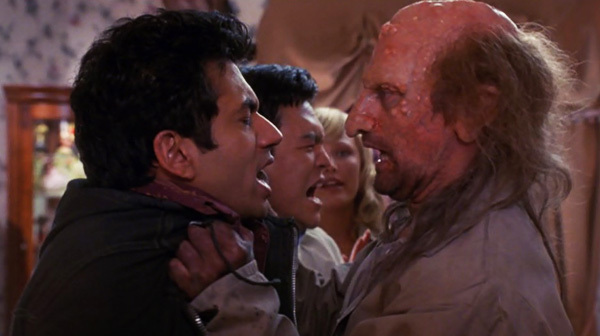 Harold & Kumar is definitely not for everyone, but it falls almost perfectly into the stoner comedy void left behind by the now-classic Cheech & Chong series. The film also says a lot about familial expectations and race in our current times. And it is pretty damn funny, too. Cho and Penn play off each other rather well, and they are further serviced by a resurging perfectly-played parody by Neil Patrick Harris (in a role that would later earn him Barney Stinson on How I Met Your Mother). Most other balls-to-the-walls comedies also get help when they receive a number of notable cameos, which this film also receives. I won’t give them all away, but Ryan Reynolds and Anthony Anderson are the most fun. 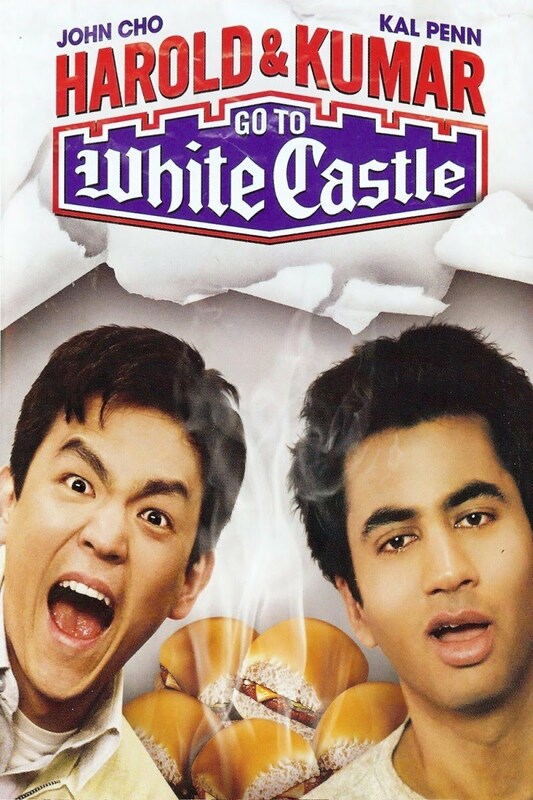 All in all, Harold & Kumar Go to White Castle is a very funny albeit by-the-numbers comedy. It has the inkling to become a tried and true classic in the genre, but only time will tell if it slips into obscurity. I, personally, do love shenanigans for shenanigans’ sake, and Harold & Kumar is chock-full. It’s a fun time, with or without a puff. 111 mins. Rated R for pervasive language, drug use, sexual references and violence. 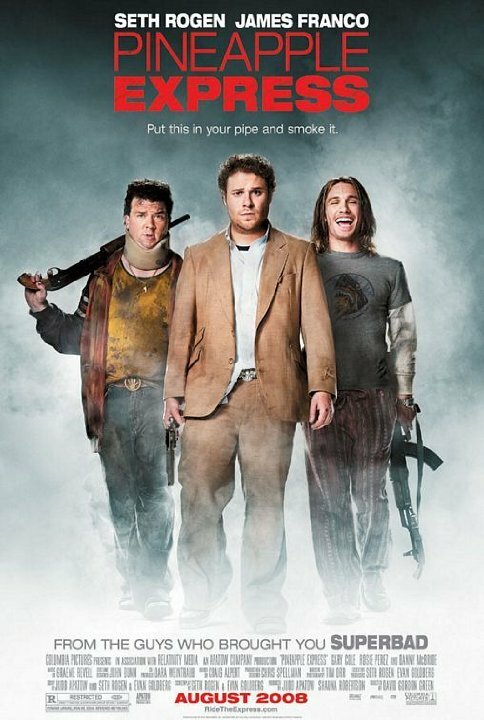 I thought we’d have some fun today with the movie selection and inject a little stoner movie into the mix with 2008’s Pineapple Express. Dale Denton (Seth Rogen, This is the End, Sausage Party) is a process server with one favorite past time. He loves getting high. But when he witnesses a murder committed by drug lord Ted Jones (TV’s Veep, Office Space) and drops a roach at the scene of the crime, Dale surmises that Ted Jones can link him and his dealer Saul (James Franco, TV’s 11.22.63, 127 Hours) to the weed, known as Pineapple Express. Now, with Jones and crooked cop Carol (Rosie Perez, The Road to El Dorado, Pitch Perfect 2) hot on their trail, the two stoners must outrun danger and find out who can be trusted and how to escape death. I have to say, I absolutely love this movie. I love the stoner straight man persona that Seth Rogen perfectly embodies here. I love the loose tonal combination of action and comedy that Pineapple Express functions with. James Franco is an excellent Saul and is joined by the untrustworthy dickweed named Red (Danny McBride, Your Highness, Rock the Kasbah) who is the middleman between Saul and Ted. The movie is hilariously written by Rogen and writing partner Evan Goldberg. There are a number of great sequences in the film, from the cold open of the film exposing the government tests conducted on marijuana to the action-packed finale. I personally enjoyed the car chases and the fight at Red’s house, but you can’t fault the film for its strange surreal look at living on the lam and the forced friendships that we create out of sheer need for survival. It is a terrific package deal for a film. I can completely understand this not being everyone else’s cup of tea, but Pineapple Express deserves a chance as it made some solid money but doesn’t really garner the kind of praise it earned. Spend this 4/20 by enjoying a fantastic stoner comedy that continues to make me giggle almost eight years after its initial release. For my review of David Gordon Green’s Your Highness, click here.